Organizing and managing a trip or event is tough. Having an itinerary planner is essential because it serves as a guide of your whole activities. If you have a plan, you will be able to complete your activities and prioritize them. This will also prevent you from missing important things to do. You don't need to start creating an itinerary planner from scratch. We have an Itinerary Planner PDF template that you can use to manage your activities. In this PDF template, you can list the purpose, location, time and activities. You can use this for event planning, trip and travel planning. Planning a business trip? 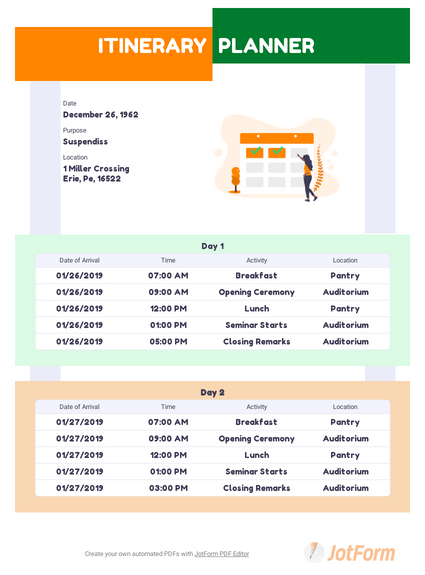 Help employees and executives keep track of travel arrangements and appointments with JotForm’s Business Itinerary PDF Template. Using JotForm’s PDF Editor, you can edit this sample.